Dave and I don’t normally buy each other gifts for holidays or birthdays and instead we buy ourselves the things we want, but this 3 Piece Stainless Steel BBQ Tool Set is definitely a gift I would choose for him! 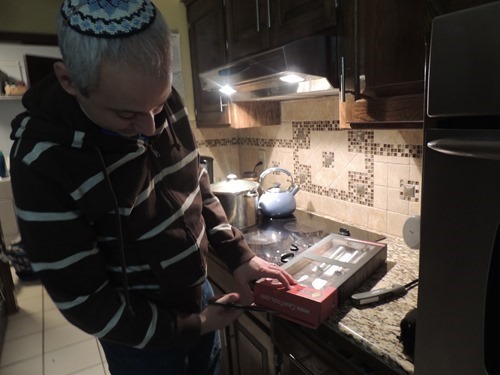 As it happened, he was able to try it out on the first night of Hanukkah, and therefore it became his Hanukkah present! This heavy duty set is made of thick stainless steel so it won’t bend under pressure. 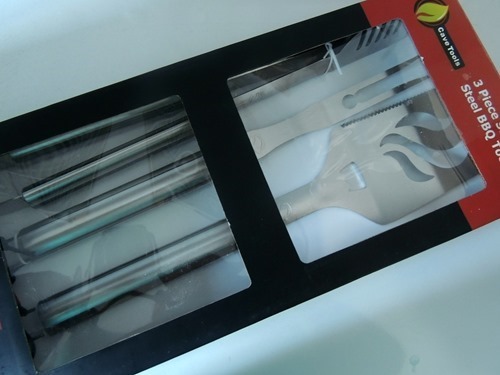 The set includes a barbecue spatula with a serrated edge which is great for cutting meat while grilling, oversize grilling tongs for reaching far across your grill, and a meat carving BBQ fork. 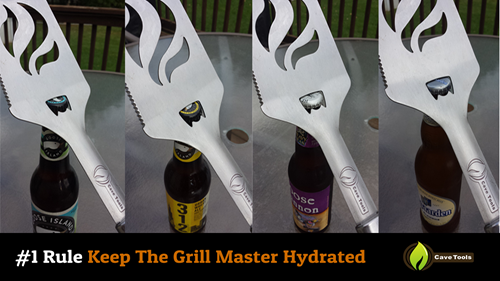 The spatula includes a bottle opener – how cool is that? These tools are quite large and therefore great for large pieces of meat, but we were wondering where we could store them. As it turns out, they have hanging hooks on the ends and are meant to be hung from the side of your grill. Also, the tongs come with a metal loop to clamp them shut for drawer storing. They are dishwasher safe for easy clean up as well. I think this set would make a great birthday or holiday gift for your husband, father, brother, or friend. Right now on Amazon, the set is marked down from $45 to $28.99, and I also have a 15% off code you can use: FWOBWJHP. 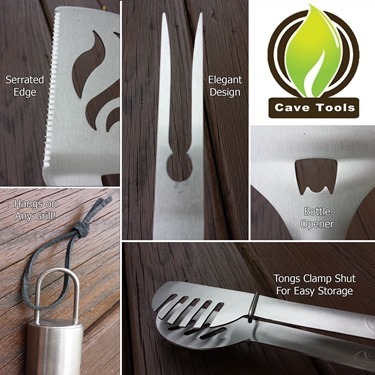 The Cave Tools website is a great place to check out their other offerings for grill and BBQ enthusiasts. Cave Tools provided us with this product in exchange for our review. No other compensation was received and all opinions are ours!